Gubbio is a well-preserved medieval hill town in the Umbria region of central Italy. 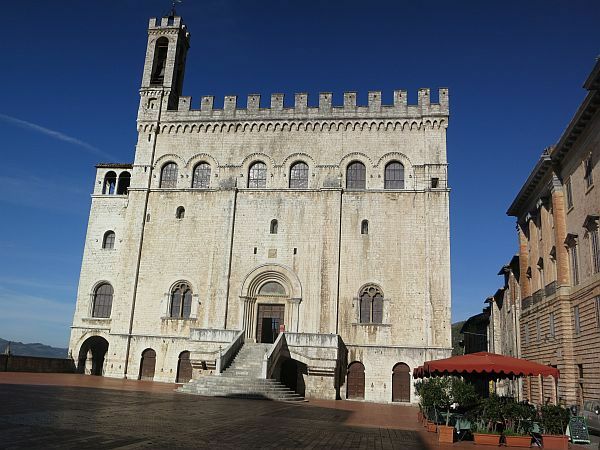 Gubbio's compact center has a good selection of medieval, Gothic, and Renaissance monuments built of gray limestone and have great views over the beautiful countryside. Just outside the town is a Roman amphitheater. Gubbio is in Umbria, twenty-five miles northeast of Perugia (see Umbria map) and about 40 miles south of Urbino in the neighboring Marche region. The town is beautifully set on the lower slopes of Mt. Ingino. The closest train station is Fossato di Vico, about 12 miles away. Buses connect Gubbio with the station and other nearby towns. If you're traveling by car, take the scenic SS298 road between Perugia and Gubbio. There's also bus service between Perugia and Gubbio. Buses arrive in Gubbio at Piazza Quaranta Martiri. Umbria has a small airport at Perugia with flights from Europe and the UK. Gubbio is about 124 miles from Rome Fiumicino airport. Hotel Relais Ducale is in a 14th-century mansion right in the historic center with views of the valley. Hotel Busone is a small 4-star hotel also in the historic center. Park Hotel ai Cappuccini is a 4-star hotel in a former monastery two miles from the city center. Farm Home Azienda Agraria Montelujano is a country house with views over Gubbio's center. For the complete medieval experience, try the castle hotel, Castello di Petroia near Gubbio. Gubbio's biggest festivals are in May. The feast of candles, Corsa dei Ceri, is May 15. The festival starts with a procession through the streets up the hill to the Abbey of Sant' Ubaldo, just outside town. Then there's a race with three teams carrying tall candle-shaped pillars weighing 200kg each, topped with statues of St.
Ubaldo, St. George, or St. Anthony. The crossbow palio, Palio della Balestra, is the last Sunday in May. This traditional crossbow competition between the archers of Gubbio and nearby Sansepolcro has been going on since at least the 15th century. Gubbio has long been known for its ceramics and there are still a number of ceramics shops selling hand-painted ceramics. There are several good shops on Via dei Consoli. Other handicrafts include wrought ironwork and lace. Market day is on Tuesday. Roman Theater, below town, dates from the 1st century AD. Open-air performances are held in the arena during summer. From the amphitheater, there are good views of Gubbio. This is a good place to start your visit. Church of San Francesco, in the lower town, is the first monument you'll come to from the amphitheater. It's on the big green Piazza Quaranta Martiri, where buses arrive. It's a Gothic church with an impressive rose window. Inside is a fresco from the 1400s, Life of the Virgen, and frescoes from the 1200s in the main apse. In the cloister are bits of Roman mosaics. Piazza Grande, or Piazza della Signoria, is Gubbio's main square. From the piazza there are spectacular views over the countryside. It's at the top of Via Piccardi, the street leading up from Piazza Quaranta Martiri. Palazzo dei Consoli is a huge 14th-century Gothic building made of limestone. Inside is an art gallery, archeology museum, and civic museum. Here you'll find the prized Eugubine tablets, seven bronze plaques from over 2000 years ago, written in the ancient Umbrian language. The palazzo, on Piazza della Signoria, dominates the town. The Duomo, still higher up, is a 13th-century church with a simple 15th-century facade. Its high altar is a Roman sarcophagus. There are notable stained glass windows, choir stalls, and a carved throne. Palazzo Ducale, built for the Duke of Urbino in 1476, is across from the Duomo. It has a nice Renaissance courtyard and the palazzo is open to visitors. Porte del Morto, doors of the dead, can still be seen in some older houses around town. Houses often had two doorways, the lower one being used to remove the dead. The Bargello was the first public building, built in 1302. It's round 16th-century Fonatna dei Matti, the fountain of the mad, was once the town's main water source. The area near here is a picturesque medieval quarter with Romanesque buildings and houses and a torture museum. Ranghiasci-Brancaleoni Park spreads below the Palazzo Ducale. It started as an English garden in 1841. In the park are a covered bridge, neoclassical pavilions, trees, and a cafe. Porta Romana, at the east end of town, is a museum with a collection related to medieval gates, including old keys and drawbridges, and some ceramics. Near the gate are two 13th century churches. Abbey of Sant' Ubaldo, just above town on the mountain, can be reached by funicular from the Porta Romana (it can also be reached by car). There are a cafe and restaurant near the church. The Rocca, above the abbey, is a good place to go for spectacular views.